Can a woman be Santa? It is a question that has caused a massive division in our newsroom so here are the arguments, for and against. The naysayers, the nonbelievers, the traditionalists all say a woman can't be Santa. But those people haven't taken the time to consider just a few things. Did being a woman stop Larissa Waters from holding her baby to her chest while speaking in Parliament? Did being a girl stop Malala Yousafzai from standing up to the Taliban and fighting for education for all? 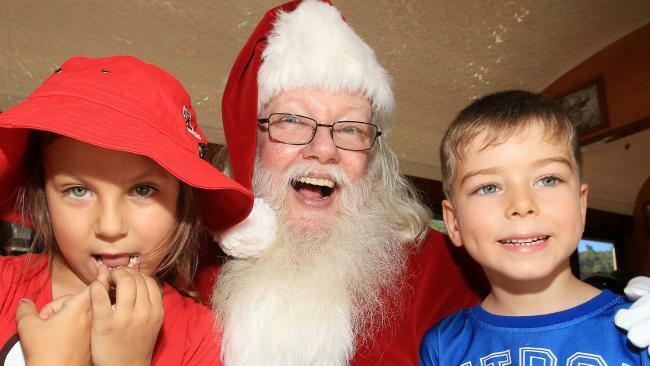 Will being a lady stop me from donning a white beard and red suit while listening to the wishes of Cairns children come December? The answer to all three questions is a big, fat, jolly no. This is 2017, a year that has been choc-full of women taking on male characters. Star Wars? Now has female leads. Doctor Who? Is now a woman. Every other male character rebooted as a woman that men have tossed hissy fits over? Played by a woman. So who's to say a woman can't play Santa Claus? Now, I'm not saying a woman has to travel all the way up to the North Pole, kick the real Santa out of his job, and crack the whip as the elves scurry to get everything done on time. I'm merely suggesting that a woman is just as capable of sitting pretty on a throne while kids line up to share their dreams of puppies, robots and iPads with her as any man is. Perhaps not every woman has a heart big enough to pull on an itchy white beard and shove a lumpy pillow down her top, but some do. But why should us willing women - from the stay at home mothers to the pantsuit wearers to the journalists passionate about celebrating Christmas - be stopped from fulfilling a little kid's dream? In the face of a Cairns Santa shortage I say to hell with gender stereotypes: we are women, we are strong, and we can be the Santas this city deserves. Do you think it is time for a female Santa Claus? This poll ended on 09 August 2017. Yes - out with gender stereotypes and in with a lady Santa. No - the original story about Santa Claus depicts a man. So he's male, end of story. This is oversensitivity on steroids. Why does it matter? Santa cannot be a woman. Just like men can't have babies. And before it all starts, yes, I'm a feminist, and yes, I was raised to believe I was just as good as men at whatever I chose to put my mind to. And yes ... after emotionally exclaiming Santa was always, definitively and exclusively male I had a moment of panic wondering how the hell I was going to rationally back that argument up. Usually, I hate playing the tradition card, but it's the most obvious reason Santa has to be a man. Ever since I was a little girl, all the Santas in the books I read, all the Santas whose laps I climbed onto, were men. The Santa would envelope you in their big arms, ask you what presents you'd most like, then dig around in his sack and pull out something which, no matter how cheap or odd, you would treasure for days. Okay, hours. It was magic and beautiful and you can't mess with generations of heartfelt memories like that by making Santa a woman. Women aren't usually as big as men so how would a 12-year-old snuggle up to a female St Nick? And let's get onto some other, perhaps less obvious points. Who would be more likely to have put on a kilo or two and be a bit out of shape because they have spent all year in a man cave making stuff then decide to lasso a dozen of the native fauna outside and get them to pull a magical wagon through no-fly zones, artic blizzards, past North Korea (!) and around the Horn of Africa? C'mon ... has to be a dude! It's like a scene from The Hangover! Mrs Claus, like every sensible Scandinavian woman in the depths of winter, is at home in front of the fire with a glass of gin, or vodka, or whatever they drink up there, and a batch of homemade shortbread, probably with a group of the local ladies, wondering if her husband's antics are finally going to go viral on Youtube this year. Santa can definitely only be a man. And we owe a debt of gratitude to all the menfolk who take on that role.